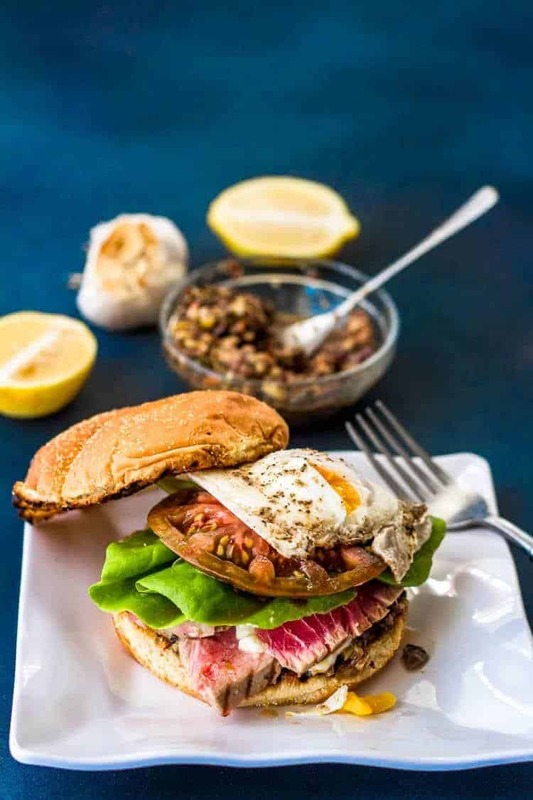 Many of the flavors of a classic tuna nicoise salad get an “updo” in my Tuna Nicoise Sandwich with Aioli, Tapenade, and Soft Egg. 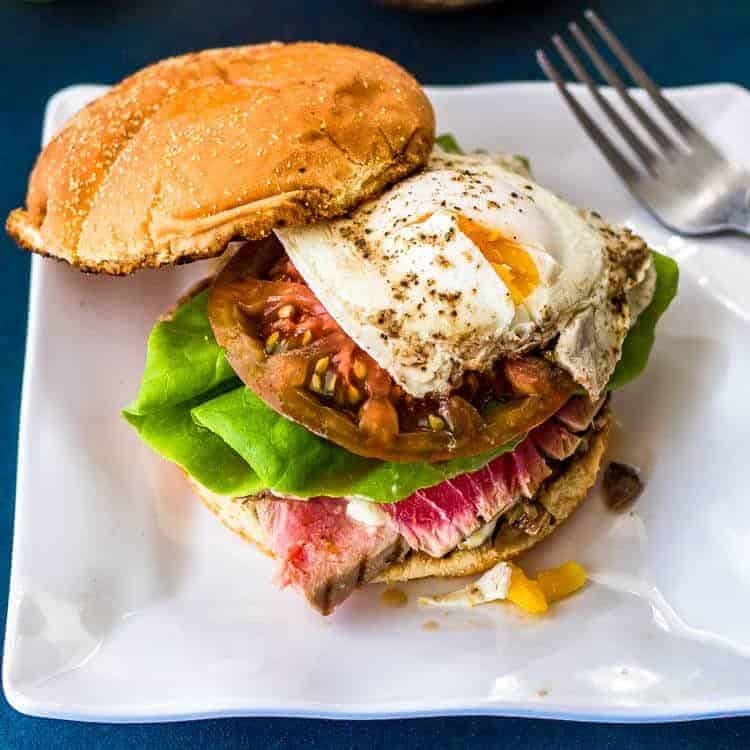 Seared and sliced ahi tuna cozies up between bread smeared with tapenade and aioli, and topped with butter lettuce, heirloom tomato, and a soft-cooked basted egg… Oh the flavor in this good for the body and soul sandwich! ~~ John Cage, American composer, music theorist, writer, philosopher, and artist. Are you familiar with the classic French niçoise or tuna niçoise salad? I have had a love affair with a tuna niçoise salad for decades (how many, I couldn’t say given my quickly aging brain 😯 ) in all its variations. I don’t even mind the “composed” version that includes boiled potatoes, haricots verts, and canned (gasp) tuna! In my mind at least, the important ingredients are really fresh, ripe tomatoes, beautiful leafy greens, olives, anchovies, and the egg. Oh how I love the egg! 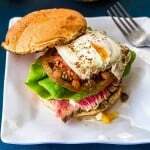 So, how did my love of salade niçoise turn into a Tuna Niçoise Sandwich? A date night with hubby on the patio at one of our favorite local restaurants: Infusions Eats & Drinks. Though it’s late September, it was 95 degrees in the shade, yet somehow we ended up on the patio… (because I love the way food tastes outdoors! 😉 ). 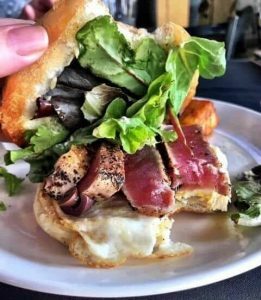 We started with a beautiful cheese and charcuterie plate, and a hot entrée held no appeal, but the Tuna Niçoise Sandwich caught my eye. Wow! It was a “home run” sandwich! As I wolfed it down, I told Mark “this must go on the blog!” So here we are.. I loved the Infusions version, don’t get me wrong. The olives were present, but they fell out of the sandwich every time I took a bite. That was the first ingredient I wanted to address. The egg was hard-cooked, but that may have been intentional. As I mentioned, a classic niçoise salad features hard-boiled egg. In fact, a runny yolk would make this delicious (but already messy) sandwich nearly impossible to eat with dignity. 😆 I opted for a compromise. My yolk is not runny, but it is still soft. My dignity stayed intact. I believe the Infusions version had an aioli, but it wasn’t memorable. So, choose your strategy – prepared tapenade and embellished mayo, homemade tapenade and embellished mayo, or go for it, and make both! Isn’t it great to have options? Searing the tuna, grilling the rolls, and basting an egg takes minutes. 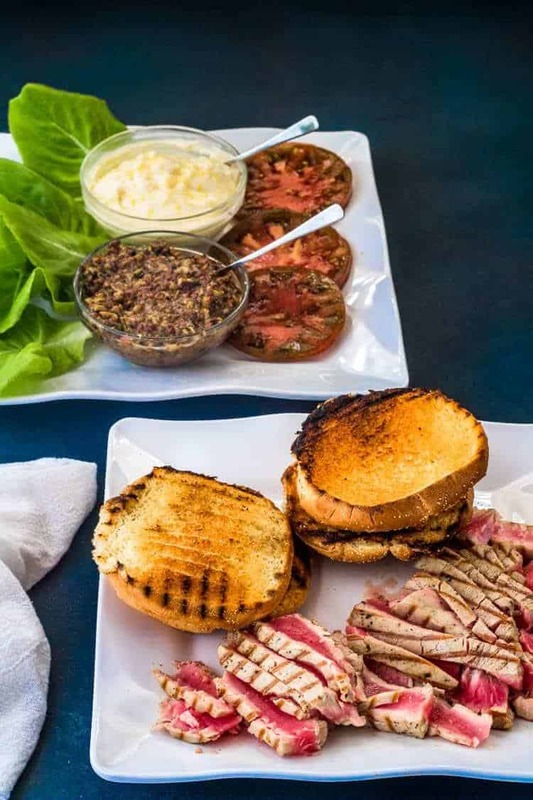 The night I shot these lovely photos, I had plenty of tapenade and aioli left from an earlier trial run, and I literally had these amazing sandwiches ready in 15 minutes! What are you waiting for? Rinse and pat dry the tuna steaks. Sprinkle with sea salt and pepper. Brush the cut side of the rolls with a bit of olive oil (if desired). Sear the tuna as desired. We obviously like rare! Grill the rolls, taking care to not burn them. Slice the tuna and tomato, and tear off a couple of nice sized lettuce leaves. Cook the eggs to your preference. We baste the eggs to medium (not runny yolk). To assemble: Spread tapenade on lower bun, top with the sliced tuna. Layer lettuce, tomato, and cooked egg over top. Last, add the top bun smeared with aioli. Enjoy! 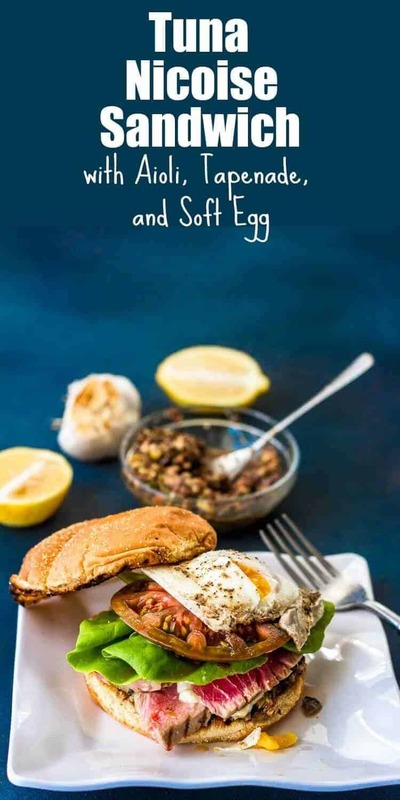 The "total" time of 15 minutes includes time to prep the tuna and rolls for the grill, slice a tomato, tear some lettuce, and then cook the egg and get after the grill. It does not include making the tapenade and/or aioli. Making tapenade takes me only about 10 minutes, and the aioli, about 15. Still not bad! I buy tuna steaks in vacuum sealed portions, and 1 is nearly enough for 2 sandwiches. I cook both tuna steaks, and slice it all. The leftovers are wonderful in a salad for lunch the next day! Macronutrients (approximation from MyFitnessPal): 385 calories; 36 g protein; 23 g carbohydrates; 15 g fat. For macros, I used 1 French foll (200 calories), 4 ounces tuna, 1 tablespoon tapenade, 1 tablespoon aioli, tomato, lettuce, and 1 basted egg cooked in cooking spray (not oil or fat).